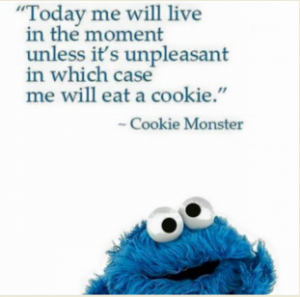 My husband recently asked me to leave cookies off the grocery list because he had been eating too many of them, which was best dealt with by an “out of sight, out of mind” diet. Over the summer his employer got acquired, and he ate more cookies because of stress without realizing it. Many people do that, of course, as shown by this word-art picture I got in an email from a coworker last month. Many years ago, Sesame Street changed the Cookie Monster to the Veggie Monster out of concern that kids shouldn’t be encouraged to eat sugary snacks for comfort. Although I can’t picture the Veggie Monster inspiring kids to clamor for lima beans, the health concern is indeed valid, given that today’s diet has way too much sugar in it. But even though it’s best not to overindulge, I have to admit there are times when nothing beats a soft gooey fresh-baked (or microwave-warmed) chocolate chip cookie after a tough day! I love cookies, but unfortunately they are not for me, or hubby, at this time. I’m taking a square of dark chocolate after dinner…that’s how sweet I can get. Yes, most days a square of dark chocolate is all I eat in the sweets category, too. I’ve felt much healthier since cutting back on sugar. When I eat a cookie occasionally, it’s just one. Hi Meg, nothing better than a sweet treat after a long stressful day. But I’m doing like your husband, keeping the sweets far away from my hands and eyes. Have a great week! Hi Becca, oatmeal raisin is yummy, it’s been a long time since I ate them… thanks!